These is no better investment than to display your artwork. So SKY-ADS provides you with a large blank canvas to write across the sky. Therefore results are guaranteed. Because while your customers enjoy the Gold Coast beaches we fly your artwork right past them. About 4 times the size of a super sized roadside billboard. 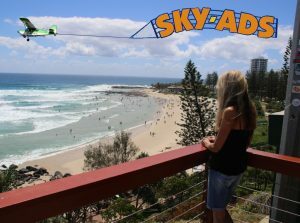 Flown just 500 feet off the beach, imagine the impact your advertising message will receive. What a great addition to any marketing campaign. Reaching a completely new untapped market. Sky billboards towed by SKY-ADS aircraft are widescreen ratios. Up to 5:1 can be displayed. Therefore our 20 foot high billboard can be up to 100 feet long. That is 30 meters long by 6 meters high. Such a massive area 2000 square feet or 180 square meters creates a Huge impact. Why is rectangle a better shape for a sky billboard? To fit any word into the confines of a square billboard the height of any letters printed on the Billboard needs to be reduced. Therefore this is the problem with a square billboard hanging below a helicopter. Contrast that with SKY-ADS widescreen format we do not suffer from such problems. Your Billboards are simply made longer to accommodate your message! Aircraft cost a lot less to operate than a helicopter! Speaks for itself really. We display our aerial billboards at the same highly economical rates as any of our sky banners. The only additional investment is a one off investment for production of your billboard. What is the Lead times for sky billboard production?